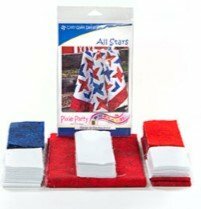 HOME > Clearance > All Stars Kit 64" x 76"
All Stars Kit 64" x 76"
Are you feeling patriotic? Try Pixie Party's All Stars. Colored in an array of vibrant red, white and blue from RJR's Handspray Line, this star spangled stunner is a perfect way to display your American pride or pay tribute to or honor a member of our military. The design features just one simple block that twists and turns to create a dazzling burst of stars. With everything pre-cut, this kit comes together in a snap. All Stars is 64" x 76", a perfect throw size.